“Oh, I don’t need any new clothes.” She gestures to a pile of folded shirts on her dresser. The good news from Irma: if you are over ninety, relax. The worst is over. If you are not, take heart, the best is yet to come. When I was a child the word used for senile dementia was “childish.” Uncle Lou was “getting childish.” Grandpa “was childish.” That meant that they were older and acted young somehow. Because of this, we were to understand and watch over them a little more. It was a gentle term, a matter of fact acceptance. When mother returned from visiting blind Aunt Ethel in the rest home, who, after she broke her hip, never got out of bed again, mom would say, “Aunt Ethel told me to go out back and get a chicken and dress it and make her some chicken and noodles. She doesn’t know where she is. She’s getting childish.” Mom would fix chicken and noodles with a store bought chicken and take them to her anyway. Mother’s pastor brings her communion. She is grateful for the fellowship, but I wonder if the sacrament seems redundant to this old Quaker, already immersed in the Light. When she prays for me and my daughter before our Christmas dinner, she draws the words up from some deep place and forms them with a conviction that leaves me shaken. My mother’s house has many rooms of treasures. If you come to visit, some of her childishness may rub off on you – her simplicity, transparency, and sense of humor. When two hip twenty-something graphic designers from a big city came for Thanksgiving, they were entranced by the carvings, my deceased father’s fifty year old book on design, the advertising in old magazines, and the relics of native Americans my father found. The young men rooted around with my daughter in closets and basement, amazed and delighted. Because they had been raised well, they recognized “childishness” and listened to Mom’s stories with kindness and gentleness. Mother showed the same politely curious interest in the tattoos, which covered most of one of the visitor’s arms, as he did in her apple dolls. Then the visitors all went out to play across the street on the swings and toys in the school yard, snapping photos on their iphones to send to their friends. They arrived early and stayed late. It was nearly midnight before Mom and I turned in on that magical day. on a late summer’s morning. The poem is based on St. Johnof the Cross’s poem, The Dark Night of the Soul. In the poem John compares the soul to a window. He sees the spiritual journey as the process of cleansing and removal of anything in us that might impede or distort the Light of Christ as it passes through our lives. In this process we become more and more transparent and childlike. “Well that is what he would say. ‘Oh, that ain’t nothing to worry about.’” And she smiles out the window. I want God to pass through me like a window, to shine on my life as on a meadow. I want to be consumed as the grass on a midsummer day. I can ask for it, pray for it, but I think it ain’t nothing to worry about. In the end such childishness is given simply, quietly in the gracious surrender to growing old. Mother puts down her tea cup and says, “After ninety three things get interesting. It is like reading a book backwards. I never understood before why people would look at the end of a book and read it first. It is smooth going. You can do what you want. People don’t expect much of you. They think you are childish. They try not to laugh, but you can see they are just dying. This post is adapted from Holy Ground, Vol. 19, No. 4 Winter 2009. Holy Ground is a quarterly reflection on the contemplative life, written by Loretta F. Ross, and published by The Sanctuary Foundation for Prayer. Go here to read the entire issue online. Download a FREE copy of Vol. 19, No. 4, Winter 2009. This entry was posted in Contemplation, prayer, faith, spirituality, The praying life and tagged Childish, Graceful aging, holy ground, Light of Christ, Mennonite, Mother, Quaker, Thomas Merton. Bookmark the permalink. Thanks for bringing me back into the last few lovely years I had with my mom. 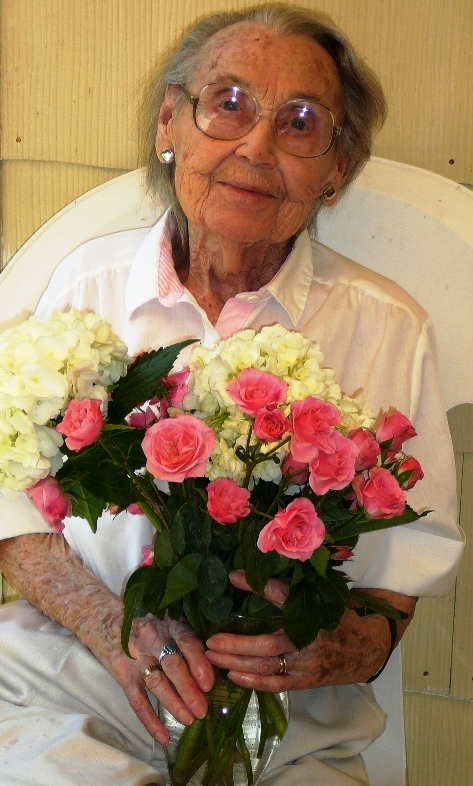 She left this earth two years ago now at age 91. Your stories about your mom remind me of her. She was a joy. Beautiful. 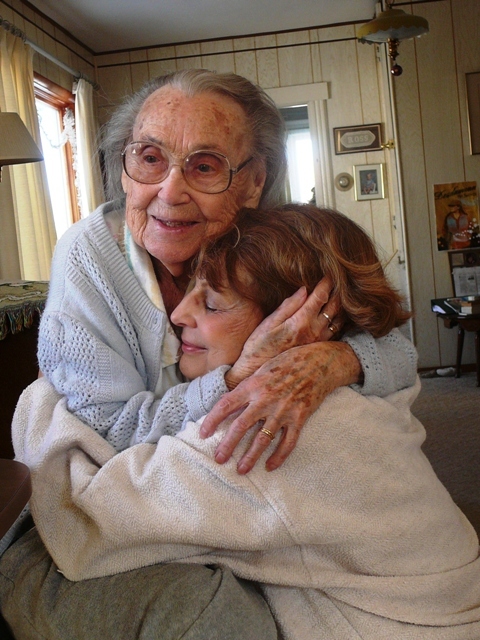 It is hard to grapple with our loved ones aging but you laid it out poeticly and with honor. As we all dissolve slowly into the great mystery it will be a blessing to have others around us who not only observe but share in our dissolution. Our mother is and always was beautiful inside and out. We were so blessed to be her children. It was touching but hard to read this my mother was older and so was my grandmother (I was raised without a father by the two of them) and they both have been gone so very long – but part of each of them still lives on in me! God has blessed you to still have her part of your life! Yes. We are blessed. She is nearing the end of life now, at almost 98. It is hard to say goodbye. I loved this about a mother. I never got to be with mom as she got older, as I lived away from home and she died before I retired. I hate that, but I had lots of wonderful memories of her and daddy. That’s all we have when they are gone is memories, and I treasure them. For therapy I put all the pictures of my mom and dad into an album, which I still have, and I have that to look at when I miss them most. Thanks Heather for this wonderful blog! Love you girlfriend! Thank you Sue. I love what you did with the photos. I might want to do that myself. Yes, the memories seem to mean more and more to me as I grow older. The hummingbird doing rolls chasing a bug is neat!!! Be sure and watch closely (around 2 min 40 sec) and check out the baby bat under its mama! If you never knew what goes on in the garden when you aren’t paying attention. Watch this – some of the finest photography you will ever see. Oh thank you, Milancie! This is awesome, beautiful! Oh Loretta. I might just yet find that peace that I didn’t think was to ever be mine. Yes! That peace is yours, your birthright.